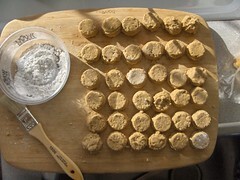 Make your centers by sifting the powdered suger through a wire mesh sieve or flour sifter to break up all the lumps. Blend the filling ingredients in a bowl using a stand or hand mixer, until it resembles cookie dough. Depending on your ingredients, you may want to add more or less peanut butter or powdered sugar. Feel the filling with your fingertips - does it hold together enough (too sticky or too crumbly are not good). Optional: Add your coarse pink sea salt - this adds a great burst of flavor that goes really well with peanut butter and chocolate. Make all your centers before you melt your chocolate. Measure out about 1TB for each center - find a spoon or gadget that works. A melon baller makes just about the right size and a shape that fits into the cups perfectly. If you don't have a mold or mini-muffin tin, roll out the centers into balls -- leave them round or press them into patties. Melting chocolate doesn't have to be complicated or intimidating. It's true that if you don't temper chocolate correctly, you'll have light gray-ish streaks and it wouldn't be fit to serve on a plate at a fancy restaurant. Let's face it -- you're going to eat it anyway. TIP: The important thing is not to add water to chocolate (that ruins it) and don't over cook it. Set up a bowl of ice water that will hold your double boiler or heatproof bowl. This is where you'll cool down the chocolate to stop it from cooking while you are working with it. Put a cup of water in your pan and start it to boil. Put about 12 oz of your chocolate in your double boiler or heat proof bowl over the boiling water. Let it melt and keep an eye on the temperature - you don't want it to get over 118 degrees. 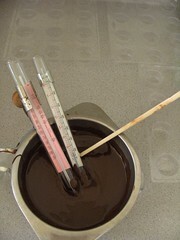 Once the chocolate has melted, take it off the heat and add the remaining 4 oz of chocolate. Stir gently until it melts and then put it over the cold water bath. Once the chocolate has cooled to 90 degrees or so, dip your centers and lay on waxed paper OR use your brush to cover the sides of your muffin tin. Don't use too much chocolate or it will just drip down and become uneven. If it drips down into the bottom right away, your chocolate is still too warm. Once the sides of your mold are covered in chocolate, coat the bottoms. Chill the mold a bit in the freezer or refrigerator - check for areas you may have missed and give another coat of chocolate. Chill again to set if necessary but don't chill to the point where the chocolate is cold and will crack. Add your centers to the mold, press gently -- you don't want to crack the chocolate. 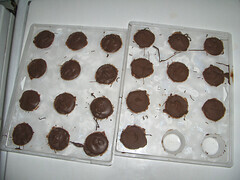 Cool the chocolates -- in the refrigerator or freezer. Once they are set, turn them out onto a clean dish towel. These will keep for weeks in the refrigerator or longer in the freezer. 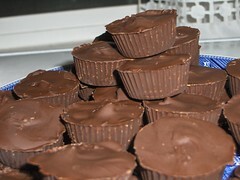 Chilled homemade chocolate peanut butter cups make a great summertime treat! Thanks for all your comments today! I'm new to blogging and really appreciate it. I don't eat sugar but these Chocolate Peanut Butter Cups are making me droole! Those look soooo good. I'm very thankful that I don't have a stand mixer and I sold my hand mixer some months ago. I just don't think I could mix up the filling by hand....which is good, because I'd eat the entire batch all by myself! You could use a pastry cutter -- you know, the five or six wires in a loop? That would work pretty darned well, methinks.